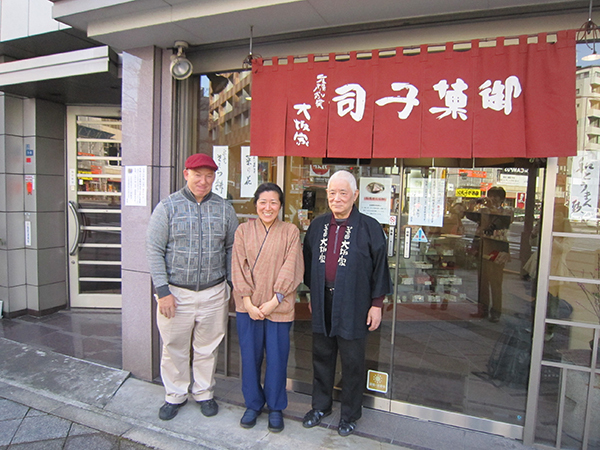 Thayne-san, today we’re at Shushiki-an Osaka-ya, a traditional confectioners in Mita in the Minato-ku area of Tokyo. This is a great location. We’re right in front of Keio University, and there’s Tokyo Tower just over there. It’s called Osaka-ya, so I presume they’re from Osaka? 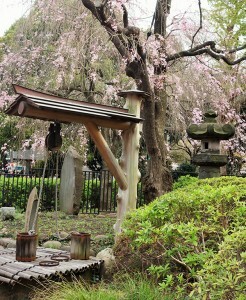 I think their ancestors were from Osaka. 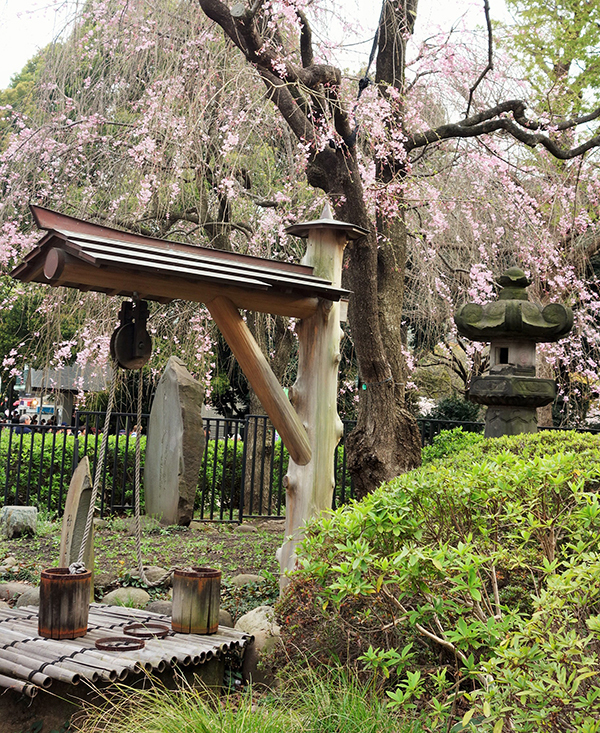 They came to Edo and established the shop in the Genroku Period (1688 – 1703). It’s a well-known store whose name appears in historical records. The present proprietor is the eighteenth generation. Thayne-san, welcome. I’m Kuramoto from the Osaka-ya. Hello Kuramoto-san. Wagashi is indeed really nice. That’s truly amazing ! It’s more than 300 years since your store was established, isn’t it? Has the store always been in this location? 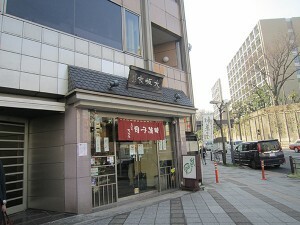 Actually, the store was established in what is now Nihonbashi Koamicho. At that time, the store was named Osaka-ya Isedaijou, but it was often called Isedaijou in historical records. We’ve been very fortunate to be able to continue to stay in business. But in 1894, during the time of my great-grandfather, the 15th generation master, the store burnt down and we moved to Kanasugi-bashi in Shiba. We started to make a comeback, but the store was once again destroyed by fire in the Great Kanto Earthquake of 1923. After that, my grandfather, the 16th generation master, decided to make a fresh start and move to this location. The person who changed the name to Osaka-ya was also my grandfather. You changed from Isedaijou and now your store is called Shushiki-an Osaka-ya. It’s a lovely name, but what does Shushiki (Autumn colors) refer to? The second generation master’s daughter, named Oaki（pen name）, was a haiku poet. From when she was young, she studied poetry under Takarai Kikaku, the first disciple of Matsuo Basho, and at the age of 13, she wrote a poem that caught the attention of an Imperial Prince and became popular during the Edo Period: There next to the well, Cherry blossoms may not last, The tipsy nearby. Once, when the young poet, Shushiki was invited to a feudal lord’s mansion, she let her father ride the palanquin ordered for her and walked instead. This example of filial piety became a very famous episode and was turned into a wood-block print. In re-tellings of the story, she became known as Shushiki-Zakura. Your store name is made up of a lot of different meanings. By the way, who is this next to you? This is my third daughter, Tomomi. She’s going to take over this store with her husband in the future. Oh, great! Tomomi-san, did you decide for yourself to take over the store? Yes. I’ve always liked making things, both now and in the past. It must be your calling! Thayne-san, would you like to try making wagashi? I was allowed to try burning the emblem into the monaka. I was nervous! I thought it looked easy, but I didn’t do it very straight and I pushed a little too hard so it got burnt. It didn’t turn out very nice. That’s right, we won’t be able to sell this one, haha. But I was able to experience making wagashi. Thank you for letting me into the factory part of the shop. It was full of a sense of freshness, and I was surprised that there weren’t any sweet smells. 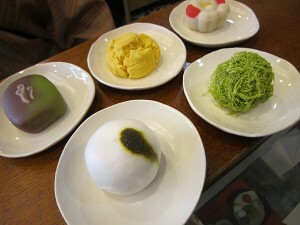 What’s the most important thing when making wagashi? The first thing is to use good ingredients. We can’t leave it up to the vendor. Of course we’ve built up good relationships with vendors over the years, but we still carefully check the ingredients every time to make we are always using the best possible. The second thing is enjoying the process. If you don’t enjoy your work, or if you don’t like the confectionary you make, you can’t continue. The final thing is preserving the style of the store. 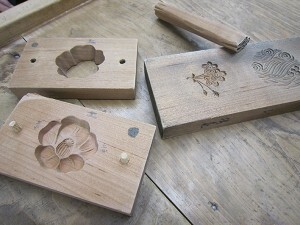 We want to do our best to carefully preserve the feeling of wagashi from the past. Of course, we have to do this while keep up with the present so we don’t get left behind in the past. Thank you for the interesting conversation. Your place really has a warm family atmosphere, and I’ve really enjoyed meeting you.